This made-in-Germany USB interface PCMCIA card drive supports 8-bit Linear flash PC cards and SRAM PC cards. In addition, it also supports Secure Digital (SD) cards and some Multimedia cards*. It adds one 8-bit PCMCIA card slot and one standard SD card slot to desktop and notebook computers through a USB port. This feature allows computers to read and write the 8-bit PCMCIA SRAM card and PCMCIA Linear Flash card, SD card and Multimedia card*. * Supports special Multimedia cards, e.g. Siemens Simatic MicroMemoryCards, Siemens FMC Cards. This USB to SD & PCMCIA memory card adapter, CSM OmniDrive USB2 LF/SD 8-Bit, accepts SD card and Type I (3.3 mm thick) and Type II (5 mm thick) 8-bit PCMCIA memory PC cards. Users can connect this PCMCIA & SD card drive to USB 1.1 or USB 2.0 port of a laptop (notebook PC) or desktop computer, to operate 8-bit PCMCIA memory cards including linear Flash and SRAM cards. It also read/write Secure Digital (SD) and some special Multimedia cards*. 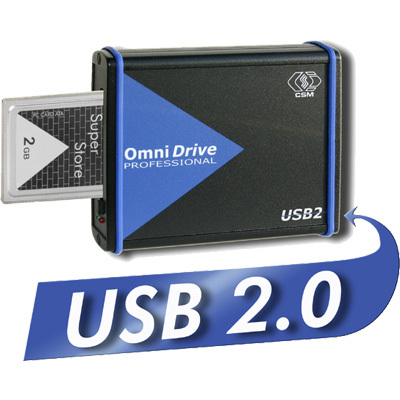 CSM OmniDrive USB2 LF/SD 8-Bit memory card drive works with Microsoft Windows 98 / ME / 2000 / XP / Vista / 7 / 8 / 10 [32-bit & 64-bit]. Some special MultiMedia Card (MMC) e.g. Siemens Simatic MicroMemoryCards, Siemens FMC Cards. Note: Does not support 16-bit PCMCIA SRAM PC card, 16-bit PMCIA Linear Flash PC card, 32-bit PCMCIA CardBus PC card, and 16-bit non-memory-type PCMCIA PC card. Supports SD card and Type I (3.3 mm thick) and Type II (5.0 mm thick) 8-bit PCMCIA cards.